Bryan Murphy (right) and Stephen Cluxton (left). IT has the makings of a sort of modern GAA joke. Did you hear about the Kerryman who took Stephen Cluxton on for the Dublin goalkeeper’s jersey? Except that it happened. 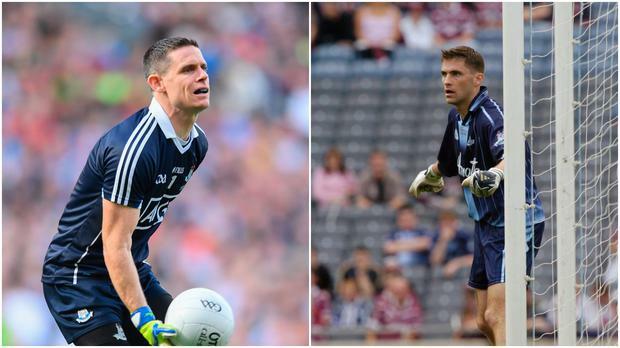 And now, all of 14 years later, Bryan Murphy remains the last goalkeeper other than Cluxton to play a senior championship match for Dublin. "I suppose I’ve an unusual background," he laughs. "But I’m up here long enough, so...."
A native of Beaufort, Murphy – who won an All-Ireland minor medal with Kerry in 1994 – made his debut for Dublin this week 16 years ago, aged 25, in a Division 2 League match against Offaly in Tullamore. A draw, as it happens - indicative of the light years of improvement Dublin have undergone in less than a decade and a half. If the relationship between counties he played minor and senior for has the making of a sort of sporting identity crisis, Murphy’s says his is long resolved. "I soldiered many years ago with Éamonn Fitzmaurice and Liam Hassett and these guys," he told the Herald ahead of the latest league clash between his native county and his adopted one this Sunday in Croke Park (4.0). "But I have more involvement and connection with the Dublin side now." "Like last year, after Kerry beat Dublin in the National League final, I got plenty of messages from my mates at home letting me know how the result went, even though I was there watching it!" Murphy’s Dublin leanings aren’t just a residential thing though. He’s been immersed in the county’s football revolution. Since 2007, he has worked as goalkeeping coach for Dessie Farrell’s various successful development Dublin squads, then the 2011 and ’12 minor sides (two Leinster MFC, one All-Ireland MFC) and for five seasons with the under-21s (four Leinsters, two All-Irelands). At present, there are 19 members of the Dublin senior squad who were part of at least one of the squads Murphy worked with under Farrell. Currently, he serves the same role for Jason Sherlock’s under-17 footballers. So he didn’t just go up against Stephen Cluxton for the Dublin ’keeper’s jersey. He’s coaching the men who have and are doing the same a decade and a half later. "It looks from the outside that Dublin have just magically produced all these players," he says. "Whereas there’s actually been a huge amount of work from the players, their clubs, the development squads and all the coaches. "And I’m fortunate to have seen a huge amount of talent come through the ranks." Back in 2003, his outstanding shot-stopping for Naomh Barróg summoned the attention of Tommy Lyons and spelled the end of Davy Byrne’s inter-county career, pitting Murphy and Cluxton against each other for that most exclusively worn Irish sporting garment - the Dublin number one jersey. As it happened, he forged a friendship with the man who would go on to become the torch-bearer for Dublin’s most successful footballing era. "Was he intense when I was there? Sure," Murphy recalls. "But both of us were. "We were going for the same jersey. We both wanted it badly." Murphy’s sole championship start came in 2004 against Westmeath in the first round of the Leinster SFC. Cluxton was serving a one-match ban for an incident the previous year in an episode that some reckon influenced his very private persona. In Dublin’s 2003 All-Ireland qualifier against All-Ireland champions Armagh in Croke Park, Cluxton kicked out at Steven McDonnell after a routine clearance, an act that appeared, at first glance, oddly petulant. Recently, McDonnell admitted he wasn’t exactly guiltless in the whole incident. "I very discreetly gave him a wee jab into the stomach," he recalled. "He didn’t take too kindly to that and lashed out with a kick. It was a spur of the moment thing but I knew it would rile him. Pat McEnaney saw the retaliation and sent him off." Arguably worse than the red card was the effective public shaming that came afterwards. "We can’t say they didn’t deserve to win it," reflected then Dublin manager, Tommy Lyons in his post-match television interview, "but I think if Stephen Cluxton didn’t get sent off we would have won that game today." On RTÉ’s live broadcast, Joe Brolly labelled Cluxton "a disgrace," and questioned whether he should ever be allowed wear the Dublin jersey again. "About eight or nine years later," Brolly claimed recently, "I bumped into him at an event in Dublin where he was with his team-mates. "I went to shake his hand and he said, ‘Before you do that, I want to tell you that for years I thought of breaking your jaw." The unlikelihood of Cluxton ever penning his memoirs means we may never fully know how the affair affected him but Murphy reckons he hasn’t budged an inch. "As a person, it’s the same guy," he stresses. "I became very good friends with him and his wife Joanne – and still am. He’s a great guy. And he has a lot of friends from home who know him even better again. "He keeps his profile to himself and does his talking on the pitch, as everyone has seen over the years." As a footballer, Murphy adds, Cluxton always possessed the drive and clarity to become a legend-in-waiting. "Naturally, like any other player, he has developed down through the years," he explains. "He was always exceptional. I was fortunate to see him at the very start, when we were vying for the same jersey. "But Stephen’s been operating at such a high level, I’m not sure if he can go any higher to be honest. He has redefined the game. "He has all the attributes. But he had them back in 2001 as well,” adds Murphy. "But as a person, he hasn’t changed a bit. Modest as ever. "Very sincere, personable guy. And as a player, absolute professional." Clearly, the relationship between Dublin and Kerry has changed beyond recognition since Murphy last played. Given the hoards of talented footballers Kerry have produced through the last four minor All-Ireland winning teams however, hope is strong in the Kingdom that a return to the more traditional roles can be established over the next few years. "They have the guts of a hundred players who are out of minor now and have All-Ireland medals, all looking to get into a squad of 30 players," Murphy points out. "So that’s a challenge for Kerry. "They have all these players coming at the same time and some are going to lose out and drift away. Whereas Dublin have had a steadier flow. "They’ve been able to bring the players in gradually and tweak the team rather than overhaul it." So for Murphy, Kerry have become ‘them’. Dublin aren’t quite ‘us’ yet but as he explains: "The way it is, I’m great friends with Stephen and I’ve been fortunate to coach lots of the current Dublin players and I know a lot of them personally. "And," he goes on, "after this weekend, I’ll support both sides in the rest of their games. "But I’m going to get slagged from home anyway," Murphy adds, laughing, "so I may as well enjoy it when Dublin win." Michael Verney With promotion to Division 1 for 2020 already in the bag, anything less than a spot in the 'Super 8s' come summer will be deemed a failure by Royal legend Trevor Giles. Conor McKeon KILDARE captain Eoin Doyle is now a major injury concern ahead of the Lilywhites’ opening Leinster SFC against Wicklow on May 11.